What is the balance of forces between the left and the government? The Iraq war is the most central issue. Here the government is in very bad shape. The occupation of Iraq is a bloody shambles. Resistance to US and British troops rises daily. The Labour government has lost its powerful press spokesman, Alastair Campbell, and seems likely to lose its defence secretary. Tony Blair's approval ratings have gone down from minus 17 to minus 28. One poll asking if people trusted the prime minister to tell the truth gave him a rating lower than Pinocchio--a mere 6 percent. And in Britain, as in the US, a majority now think that the war in Iraq was not justified. The warmongers are in trouble, but the anti-war campaigners are stronger than ever. The Stop the War Coalition organised 100,000-plus people to demonstrate against the government on 27 September. For all the talk, much of it from the left, that the anti-war movement had disappeared from the streets, this proved an amazingly large and committed core. The last time such criticisms were made was when the Stop the War Coalition called a demonstration in the spring of 2002 between the Afghan and Iraq wars. Then 20,000 demonstrated, despite the scepticism of many on the left who thought the turnout would be miniscule because the Afghan war had ended in a US military victory. The comparison in numbers indicates that the base of the Stop the War Coalition is now five times greater than it was in 2002. The coalition's alliance with the co-sponsors of the 27 September demonstration, the Campaign for Nuclear Disarmament and the Muslim Association of Britain, has been strengthened. And the level of trade union support has risen considerably. The TUC passed a tough anti-war motion in line with Stop the War Coalition policy for the first time this year. 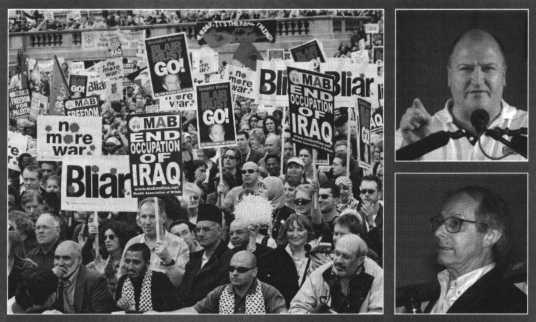 At just this moment the government chose to invite George Bush to Britain for a state visit in mid-November, setting the scene for a clash with the anti-war movement. The importance of the demonstrations during President Bush's visit is underlined by how the government is trying to regroup its forces in other ways. If the government is in trouble over the Iraq war, its managers must be quietly confident about how it's dealing with the trade union awkward squad. The FBU dispute was largely a government victory. Government supporters were openly gloating over Mick Rix's removal as leader of Aslef. And the loss of the CWU national ballot for strike action in the Post Office has only been redeemed by unofficial action in Oxford and Wolverhampton, and by the action in London. But the best day for the government, indeed the only good day for the government on the Iraq issue since Saddam's statue came down in Baghdad, was at the Labour Party conference. Led by Derek Simpson of Amicus, the four big unions refused to prioritise the Iraq motion. Consequently, the main issue in domestic and international politics for the last 12 months could not be voted on at the Labour Party conference. Defeat on the issue of foundation hospitals could never have had the impact that a defeat over the Iraq war would have had. The whole left, both inside and outside the Labour Party, suffered as a result. Even Gordon Brown's 'I want to be leader' speech was left high and dry. No forces arrived to make Tony Blair look in need of early retirement, and Blair's own speech recovered the initiative in the conference. The result was that, although Blair is no nearer winning the argument over the war among the general population, he emerged from the Labour Party conference feeling confident that a majority of constituency delegates supported him, and that the big unions were at least loyal enough to step aside on the critical issue. This whole debacle means that the 'reclaim the Labour Party' argument looks very hollow indeed. But there is a real danger here. The longer the government continues to alienate and disappoint its supporters, while the 'reclaim Labour' awkward squad defend staying in the party without making any gains, the more they delay the birth of a real alternative to New Labour. And the more they delay the birth of this alternative, the more other political forces, like the Liberal Democrats and the BNP, will fill the vacuum. Equally seriously, if some political alternative does not begin to take shape, the compromises that Labour supporters in the unions are making on the industrial front will sap the confidence and combativity of the mass movement. The radicalised mood around the war also expressed itself in the FBU dispute, and is expressing itself in the Post Office disputes. But if there is not a political leadership whose first loyalty is to promoting rank and file action and not to the Labour government, there will be further failures and compromises. This will ultimately undermine the mass movement as well. Either the mass movement will pull up the level of industrial struggle or the compromises of the pro-Labour camp will limit the revival in the unions and pull down the general political radicalisation. This is why the question of forming an alternative political leadership based on the mass movement is so critical. The forces brought together by the anti-war movement have the capacity to do this. In the RMT and the PCS we already have leaderships who have broken with Labour. There are many Muslims who have been politicised by the war. The victory of Socialist Alliance candidate Michael Lavalette in the Preston council elections shows how willing many of them are to work with the left. George Galloway's expulsion from the Labour Party will mean that many activists will conclude that New Labour is irreformable. And George Galloway himself has said that if the Labour Party cannot be reclaimed, then it is time to start building a united left alternative to New Labour. Many other important figures on the left, like George Monbiot and Ken Loach, have been actively campaigning for such an alternative to be formed. It has been the policy of the Socialist Alliance since its last conference, embodied in its most recent pamphlet, to actively work to promote such a broad platform to challenge New Labour. Such a coalition could overcome the lack of real weight that has hampered the development of the Socialist Alliance. It could contest the Greater London Authority and European elections next June with some real prospects of success. Even the public meetings and rallies that it could hold would create an audience for radical ideas that would stretch way beyond the current remit of the left. There have been huge meetings around the themes of anti-capitalism and anti-imperialism in recent years. But because of the decline of the Communist Party and the Labour left over the preceding 20 years, the ideas of the workers' movement and of socialism are not yet so widely accepted. This is an opportunity to make good that deficit. Most immediately, however, the left needs to make sure that the political spectrum is pulled to the left by the demonstrations against Bush and by the successful launch of a new left platform. If we don't do this a failure of leadership will allow the initiative to pass back into the hands of the government. And if this happens the current and future failures of the Blair government will lead to further demoralisation and gains for the right. For this perspective to work, a clear and consistent orientation by the SWP and the Socialist Alliance is needed. It is the supporters of these organisations that have the largest organised political presence outside the Labour Party. We need to be clear among ourselves that continuing the broad cooperation with Labour supporters in the Stop the War Coalition and organising separately to build a challenge to New Labour is both possible and desirable. By the same token, selling a paper and maintaining a revolutionary organisation like the SWP is not only compatible with building broader movements, it is one precondition of their success. The tactical and strategic arguments advanced by the SWP within the Stop the War Coalition have drawn on a much wider framework of historical experience and Marxist analysis. They would never have been accepted if others had not also come to similar conclusions, often from quite different perspectives. But they would not have been so influential, nor would the decisions have been so effectively translated into action, had not an organised body of socialists been willing to advance them and act upon them. In this way a revolutionary organisation willing to work with others in a non-sectarian way can both advance the interests of the whole movement and strengthen that movement's core of determined socialist opponents of the whole system. To make a start on that work now, socialists need to contact RMT members and other union activists, Stop the War Coalition supporters, Muslim activists in the anti-war movement, Labour Party supporters and many others to begin discussions about how we can form a broad-based alternative to New Labour.